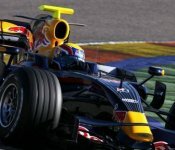 The Red Bull Racing team started off the Barcelona test session with a radical new engine cover. The team promised some radical aerodynamic updates before the Australian GP and this new engine cover design is just the beginning. The Adrian Newey impact at Red Bull starts to show more and more. All in all, the new RB4 was nothing spectacular at its launch as the aerodynamics were merely tweaks or copies of the RB3 packages. However, just like about every other team, aero updates will follow quickly and Red Bull have started early. The new engine cover makes use of the maximum size limitations. It extends at the maximum car height from the airbox up until just above the rear wing.